This week's nail design is actually what I had on my nails last week. As you guys know I did not have access to my laptop for a week so it kind of messed up my rotation. Oh well.. at least I am still posting it =).. I really like this design.. it is one of my favorites.. actually probably my all time favorite. I really liked how it came out. I was inspired by my a birthday/mother's day card I made for my boyfriend's mom I think last year or the year before. Well wanna see the rest of the photos? 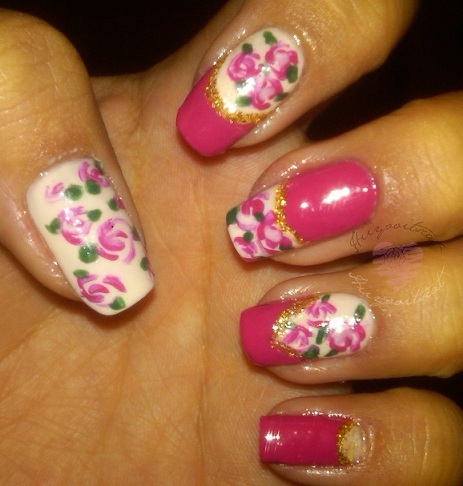 and a how to tutorial for this nail design? Here is the guide on how I did my nails. Hopefully it helps you guys make the roses.. The black part is a easier guide I made from paint incase the actual photos did not help. You can just a thin nail art brush or an eyeliner brush you no longer use. You can also use a toothpick or anything with a pointy end. If the rose doesn't look like a rose or flower after putting the leaves on.. grab the light base color (sheer polish recommended) and just dot it in the center of each flower.. it should make it look more like a flower. Once again I did each hand a little differently. Here is my right hand. The polish color varies depending on the flash and light. and here is my left =).. its a little more subtle. In some lights and flash my nail polish looked more magenta pink.. You can see that the design looks great in magenta as well. You can def. do this in any color and it should still look great. 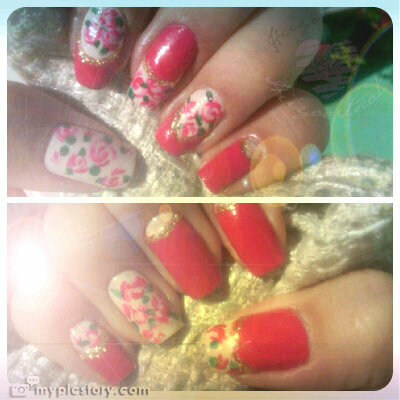 and of course I would have uploaded to instagram first @hiiyooitscatb.. but my boyfriend wasn't around for me to use his phone lol.. so I uploaded it to my picstory (blackberry app).. This has to be one of my all time favorite nail looks. It's the first time I actually did the flowers by hand instead of stamping. The colors are great and the design is great. Anyone can do it.. even if you have shaky hands as long as you work on it, you can achieve it. Take as long as you want to get it the way you want.. and if you mess up just alter it to fix it instead of taking it off and redoing it. You will be surprised how easy you can fix a mix up. I hope my "how to tutorial" helped.. It was hard to do a video so I did a picture tutorial. If you decide to try it out.. be sure to share on my facebook "hiiyooitscat" I would love to see it! P.S I know the giveaway ended last night.. just give me some time to go through all the entries and I will email the winner and post the winners name once I am done. Ok you totally need to do my nails. Your creativity amazes me. Awesome job hun. I love how each nail is different! Superb post!!!!!! just wanted to stop by and let you know I nominated you for the Versatile Blogger Award. go to http://beautyshoesnailsfun.blogspot.com/2012/08/versatile-blogger-award.html for the rules on how to accept it. aww cool!! I will check it out soon! thank you! You're welcome! I hope you try it out!